Influenza, often referred to as the flu, is a contagious illness caused by the influenza virus. Symptoms include fever, a runny nose, a sore throat, fatigue, headaches and muscle aches. Most people sick with the flu get better in a few days. However, there are risks of complication for some high-risk groups, such as young children, especially newborns. 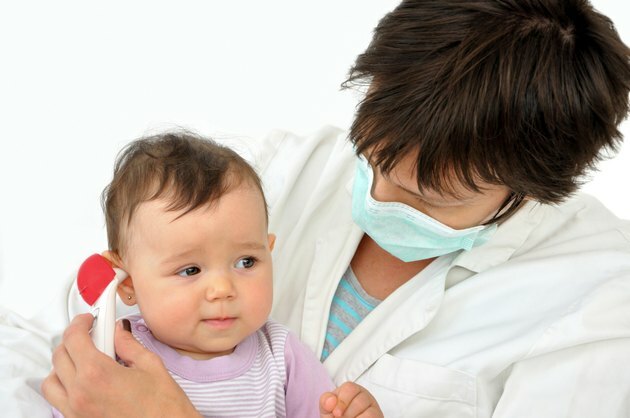 Contact your child's doctor immediately if you suspect he has the flu. Newborns are at high risk of getting influenza because their immune systems are still immature. This makes them less able to fight the virus. Newborns who have the flu can exhibit different symptoms than people from other age groups. They might a high fever and no other symptoms, or they may have vomiting and diarrhea. Red eyes or an earache are also common symptoms of flu in newborns. It is common for some young babies with influenza to develop the croup. The croup is a throat infection that also affects the vocal cords and can cause breathing problems, loud breathing and a barking cough. Lung infections, which could result in pneumonia, are another possible complication in newborns with the flu. Influenza in newborns can also lead to ear and sinus infections. In extremely rare cases, influenza complications can lead to heart, brain and immune system problems in young babies. Newborns who have any influenza symptom should be seen by a doctor as soon as possible. According to the Canadian Pediatric Association, acetaminophen can be given every 4 hours to lessen fever or pain. Parents should talk to their doctor or pharmacist for directions on what dose to administer. If your baby has a fever, dress her in lightweight clothes and keep the room temperature should always be around 68 degrees Fahrenheit. It is very important that sick newborns remain well hydrated, so feed you child small amounts of formula, breast milk or other fluids as directed by your child's doctor. Because antibodies from a flu shot are transmitted to the baby during pregnancy, it's often recommended that pregnant women get the flu shot to protect both themselves and their baby. A study published in the "American Journal of Obstetrics & Gynecology" demonstrated that newborns whose mothers received a flu shot during pregnancy were approximately 48 percent less likely to get hospitalized with the flu than newborns whose mothers were not immunized. All other family members are also encouraged to get immunized so that they don't transmit the flu to the newborn. Anyone who has contact with the newborn should wash their hands often, especially when caring for the child.